- Alchemy Rate has been increased. 5) Medusa/Gladiators/Arabia/Bone Roc Uniques HP has been reduced. Many changes have happened to pretty much every section of the game to ensure our 2nd month will be as active as the first one! Thank you for this amazing first month, best of luck to all players. -Experience rate has been greatly increased. -Death Bone Roc now spawns in Job Temple (sanctum of Test [INT], sanctum of Ripple [STR]). Drops are similar with Medusa the only difference is that you can also get direct Seal of Diamond set drops! -You can now collect Advanced Elixir Material from Dungeons. You can buy Advanced Elixir [+1] at Ruby Speical NPC using the materials you have collected. 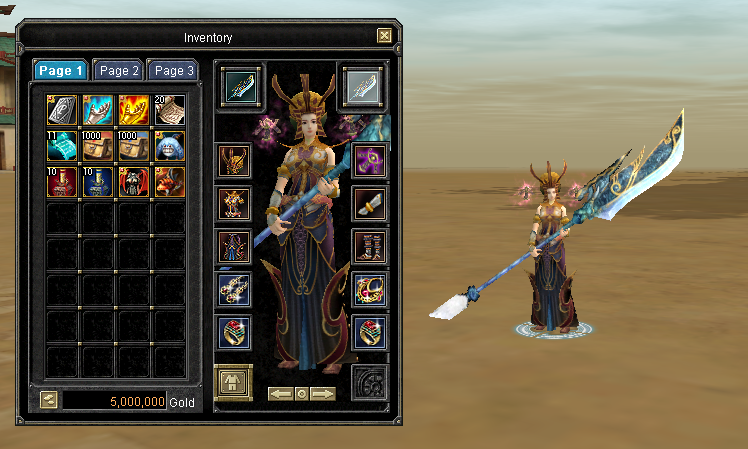 -Diamond set & accessory parts have a hard chance to drop from d10 monsters. -New stones for upcoming Seal of Moon items are now available as monster drops. -Reduced Ruby Jewels requirement of Seal of Moon weapon to 750 and increased the Ruby Tokens requirement to 1800 to make sure they will be available after the fortress war. -Ruby Jewel now drops from dungeons. Devil dungeon unique drops 7 and each Paradise dungeon unique drops 5. -Jobbing now also gives a low amount of Ruby Jewels. -Brand new trans pets (Behemoth & Lizard) are now available on the item mall. -Teleporter back to Donwhang is now available on Medusa room. -New character effects are now available on the item mall. -Ruby Point boxes now drop from Holy Water Temple. -Union limit has returned to 4 after big demand. -Exchange in Battle Arena has been disabled. -Fire horse is now available with higher HP than the normal horse. -Jobbing event will now also give 50% more gold while it lasts. -Running Rabbit has been added, if you catch it, you will get 20 silks! 5 spawn every 5 hours around Donwhang. 1. Magic pop with a very hard rate. 4. Diamond Crate B: Available at Ruby Special NPC, Dungeon Uniques, Arabia Uniques, Holy Water Temple Uniques & Job Uniques. -Guild Manager Musai has been added to Donwhang (FGW Collection Reward). -BA/CTF Rewards will be replaced before the weekly reset with ones that don't give Honor Point. -Job Kill delay has been fixed. -Devil/Paradise Dungeon Uniques damage have been increased. -Job Temple Quest now gives 1 Immortal Stone for 40 kills. -Added Snow Delay (filter-side), it will be reset if you re-log. -Union limit is now 3 to increase the competition even more. -Forgotten World Portal 3* Price has been corrected to 125m. -Added Medusa STR, it spawns at 22:30 (GMT+1 Server Time). -Improved Holy Water Temple drops. -Character/Guild/Pet Names has been disabled in Survival/LMS/FFA events. -Top 5 players of each survival event will now receive Ruby Jewels based on their ranking. -Every elo ranked player will now receive weekly rewards after the elo reset. -Honor ranking has been reset due to a bug with the CTF/BA rewards allowing players to stuck them and use them after the reset, we have fixed this and it won't be possible anymore. -Experience rate has been doubled. -Disabled usage of all scrolls that would teleport you while wearing job suit. -Last Man Standing event is now available, more information about it will be given once the server is online. -Increased Immortal price on Ruby Special NPC to 100M to increase gold value. -You can now teleport to Medusa room from Donwhang. -Medusa drops have been greatly improved and it now -have 50% chance to drop Seal of Star and also drops 10x50 Silk Scrolls. -Improved filter delays and increased them for a better in-game experience. -You can no longer register in PVP Matching while wearing Job Suit. -Spawn rates on same areas have been increased. -Increased cool-down of 5 Arrow Combo and 6 Arrow Combo to 8 seconds. - FFA now will auto equip PVP Cape. -Improved HWID security even more. -Removed the speed effect to improve FPS on the game. -Fortress war is taking place this Sunday at 19:00 GMT+1(server time), 2 fortresses will be available (Constantinople & Hotan). -Battle Arena rewards have been greatly improved as you will now get both honor points and ruby jewels from winning or losing. Of course winning gives you more. CTF Kill will give you 1 honor point and 1 ruby jewel. BA Win will give you 9 Honor Point and 15 Ruby Jewel. BA Lose will give you 3 Honor point and 5 ruby Jewel. -Seal of Moon weapons Ruby Jewels requirement has been increased to 1.000 to make BA/CTF a lot more active. -Alexandria South trader npc has been removed.